Oh . my . goodness…it’s back…and I am so happy to be a guest teacher in Let’s Face It in 2018!…Eeeek! I fell in love with Let’s Face It in 2016 when I taught my first ever online lesson! …ever! It seems like such a long time ago. 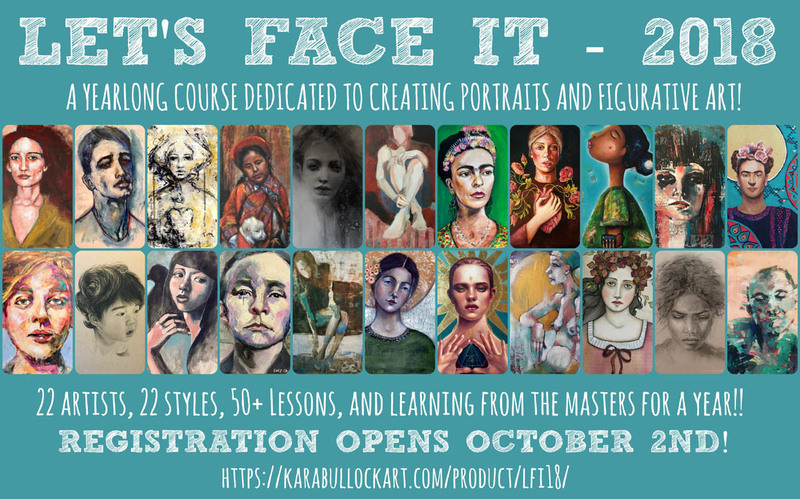 LET’S FACE IT is a year long course created and hosted by Kara Bullock. It is for anyone that wants to practice creating portraits and figurative art, (my favourite kind of art!) but is especially designed for those of you that have felt scared or intimidated to do so at some point in your life. Together, we want to share with you our strategies, tips, and techniques that we use in order to create our faces and portraits. You will leave this course feeling confident enough in your skills to never feel intimidated again! In 2018, we will be studying the different art movements and master artists from those periods! And I am so stoked that my Master Artist’s are Berthe Morisot and Elisabeth Sonrel, two amazing artists! 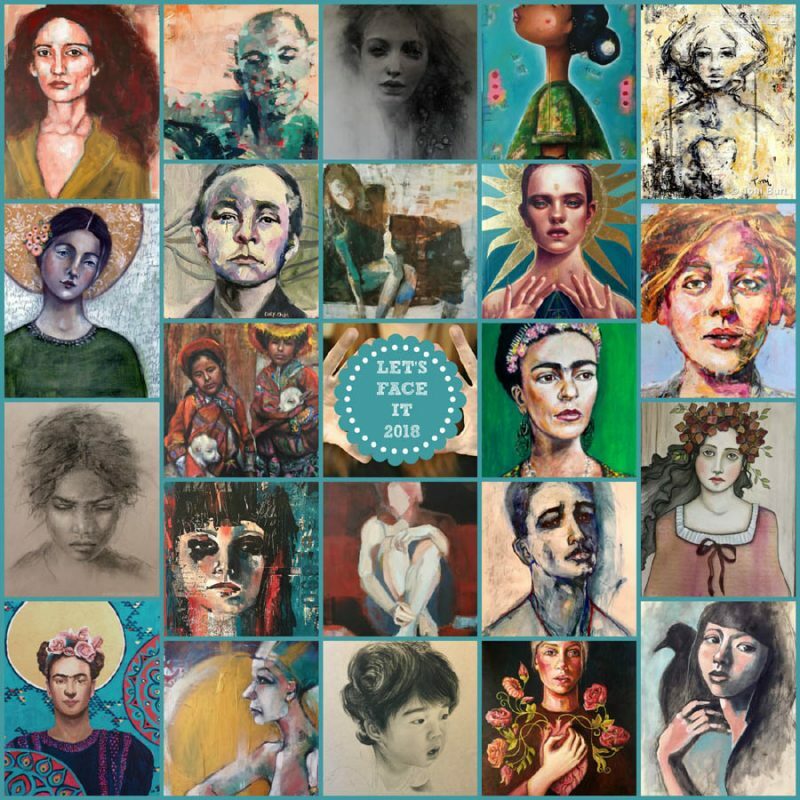 I just love their work 🙂 …and can’t wait to create my lessons inspired by the incredible women they painted. And whoa! look at all the amazing teachers you will get to learn from in 2018! This course is not open for registration yet! (only a few days to go!) However, you can read more about this course and bookmark this page here so that on October 2nd, you can come back and register. What is even better is that if you register by December 4th, you will get a discount on the price! Yay! Whoop! 2. Leave a comment below letting me know why you love creating faces! Creating faces satisfies me like no other art. I don’t know why, though! The first online art lesson was coming down and i silently said to myself, oh please dont ask me to draw faces and guess what the very first lesson was on? Yes, drawing faces! But the teacher showed me HOW to draw a face, then i fell in love with faces! I love drawing faces because I want to be skilled enough to draw likenesses for my friends and family. It seems to please people so much to see their own image. I would be the happiest ti win a spot. I started to paint faces and would be great to dig in deeper. I know some teachers but this is the first time I hear about this fantastic year long course. I’m grateful for the possibility because it sounds great. Your paintings are beautiful. I wish to see your lesson. Drawing faces is an unending fascination. I’m not really sure why faces are my favorites…maybe because that’s what I’ve drawn most since I was a kid. I used to draw comic book people, especially Katy Keene, Millie the Model, and Brenda Starr from the Sunday comics. I still love that “beautiful girl” style. I really hope to win. Have a new car. It would help. Lol. I am fairly new at drawing and art but love faces through art and love the idea of a course to work through the creativity of doing it myself. Toni I did a class with you at Monica’s and you made it look so easy. If only. Would LOVE to win spot in this class! Cant afford on my own, and starting to branch out of my comfort zones. And love so many of the artists & would love the opportunity to learn from each one. Portraits can be created in so many art mediums , one does not need a ton of different art materials to create the most amazing expressions in portraiture , A simple pencil or piece of charcoal will surfice to create a masterpiece. I just love the depth of feeling , expression and emotion one can create when drawing a face, and no two will ever be the same. Looking forward to this class and maybe a special chosen seat in the classroom. Love your work Toni. Keep creating everyone . Shared on Facebook . I love learning how to paint faces because of all the different types of emotions and styles, each face is always different just like every person. It is a wonderful way to spend my free time, learning to create beautiful faces. I love painting faces as there are so many different ways to create expression & emotions, making each one special & unique. It is almost impossible to paint two faces the same. I’m enjoying learning all I can. Left a comment & shared on Facebook! I love drawing and/or painting portraits. Each one is uniquely different & seems to have life of it’s own as we lose our self in the process of creating …whenever I finish a portrait & view it, I am often stunned with the image & feel that it a higher self working its magic. I am looking forward to Let’s Face it 2018 for more inspiration, change & growth in finding my own style. I am thrilled that you will once again be part of this process. I really need a class like this because I’m Horrible at painting faces!!!! Last year I wanted to take more classes involving faces, but it was stressful and I was not enjoying myself at all. But I really want to acquire the skills to create a beautiful face 😀 I think this class will really help. I love faces. The perfectness of the inperfection, every freckle, line, smile, frown, the sparkle in the eyes etc. All tell a story of the souls experience. Faces to me are caressed by life. They make me want to sit down, have cup of coffee and hear their stories. I would love to be able to learn from such an amazing group of artists. Thank you for the opportunity to win. For me, faces are unpredictable so I am always happily surprised by the outcome. Every face is unique and beautiful in its own way. shared… and I love painting quirky, fun faces! I love painting faces because I never quite know who is going to appear. It’s like they magically arrive out of the ether. I love faces but am not that good at them. This would be such a good class for me. Still new and learning! Thanks for the chance! I Love creating faces because of the diversity that you encounter, it is so unique to each individual and so precious to each person! I’m in love in capturing an expression or the eyes or a smile or a nationality… I’m passionate about it! I would love to get a spot so that I could develop my art in what I like! ❤️ Thank you for the opportunity! I love painting faces because they give the artist the chance to share the emotion of the subject with the viewer and establish a deep connection between them, even when the painting is intuitive and the subject is inside the artist. Each face is unique and beautiful – and I love trying to capture that beauty. I shared on FB! I love the challenge of capturing a personality on paper with different mediums. I love painting faces because faces have so much unspoken expressions. I am working so hard to be able to capture emotions in my drawings and paintings. I’ve been practicing and practicing and would love to win a spot. Shared!…I love faces because every one created is different and unique!! I love faces because you can see and feel their emotion. Every face is like a snowflake or a fingerprint, different, and beautiful! Hi, Toni! I did share on FB. Why Faces? I think it’s because they are so authentic and real. Because there are so many different looking people in the world, it’s OK when our portraits may not look exactly like we’d hoped for. For me, there is always an element of vulnerability, sometimes frustration, wonder, gratitude, and acceptance by the time I am finished with a piece. I enjoyed your lesson in A Thing Called Love. Thank you! I’d be so thrilled to win a spot in LFI 2018. Shared! Thanks for the chance to win a spot. I love doing faces, especially strong women. I have enjoyed your lessons in various classes and look forward to next years also. Berthe Morisot is so interesting!!! Can’t wait to see what you do with that. Shared! Thanks for the chance to win a spot. Faces, especially strong women, are my favorite subject and I can’t get enough. I have enjoyed your classes before and I’m sure your new lessons will be wonderful! Berthe Morisot is a fav and a very fascinating painter. There is a great novel about her and Degas and Manet etc. It is fiction, but based on history. The word ‘Violets’ is in the title. I gave my copy to friends so I don’t have it anymore. BUT, worth reading!!!! I love creating faces. It’s what I always seem to create. Different features and unique looks are what I’m drawn to lately, and I love looking back at how far I’ve come over time. I love creating faces because it is a challenge that pushes me to learn more. I have almost finished my 1st year in Let’s Face It and it has been a wonderful journey. I am practicing values and learning to put expression into my faces. I want more so to win a free spot would be fantastic. Shared on FB! I haven’t always been interested in painting faces, but now it is interesting to me, especially since I fell in love! Now I draw my husband’s face, and have become interested in other faces too. We humans are so beautiful! I haven’t always been interested in painting faces, but now it is endlessly fascinating to me, especially since I fell in love! Now I draw my husband’s face, and have become interested in other faces too. We humans are so beautiful! I would love to spend an entire year focusing on faces… they can express just what one is feeling without a word being said; I want to be able to convey those feelings in my art work, too! Shared, of course! I love painting portraits because every face is so unique. I love watching what comes to live as I add layers and marks. I love the whole process!! Shared on fb. Faces are endlessly fascinating to me…can’t stop! Shared on facebook. I have learned from you in several classes and continue wanting to learn the techniques you teach to be loose and free in portriats. Shared! Still leaning to master the art of faces. Looking at this wonderful line-up of artists there is no doubt that all will learn tons!!!! I love taking classes about drawing faces because my whole portrait goal was being able to draw my grandchildren with a decent likeness! My love for portraits has just exploded from there! I love faces and portraits! Would love to keep learning from fabulous artists! Faces truly are the representations of their lives ! Faces are so fun to create…. you can show such depth and emotion in them if you know what you are doing!!! LOL! I love your classes so much and can’t wait to see them. thanks for the opportunity to win a spot! hi Toni, I love to paint faces because each on is unique and different. Thank you and shared on FB. I love creating faces as they give me so much satisfaction, pleasure and sheer joy. I shared!!! Yay for you. I love your art. I don’t know why I’m drawn to painting and drawing faces. I always have. It’s just feels right. I shared on facebook! I am uncertain why I am drawn to faces but I surely am. ALmost without fail when I start a project with no intention, a face emerges one way or another. I love Let’s face it and I would be so thrilled to win and I am so thankful for these online courses. I got a late start with art and now I can’t imagine not having art in my life! Thank you for this opportunity. I have admired your style for a while now and would love to win a spot in Let’s Face it 2018. Thank you. Ah faces! the most challenging of all. What a wonderful opportunity you are offering and an amazing slate of teachers . This looks like a new world of discovery. Thank you for your gracious offer. Shared! I love creating faces and I would like to improve. I have tried flowers when I took your Petit flower class, but it was just too complicated. I love seen faces come to live. Like they are trying to give you a message. I loved your lominus soul class and I would love to win a spot in this class. Thank you for the chance. I love creating faces! It is like I am revealing a secret part of me to the world. Just a sneak peak to tease. Drawing faces can be so challenging. For me, it’s all about capturing the essence of the person. Toni you KNOW I ❤️ your art!!!!! I would do love to win this!!! I have so much to learn and do little time!!!!!! Thank you for this chance!!!! I shared on FB. I love to create faces because faces can tell a story. There are so many emotions which can be expressed on a face–love, hate, anger, happiness, sorrow, grief, pain, aging and so many more. Faces can be so expressive and they can be a way to communicate. Thank you for an opportunity to win. Shared! I love creating faces as I find them all very interesting and unique. They are my absolute favourite subject to paint.